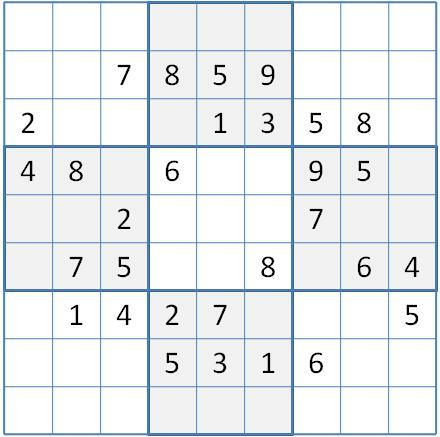 This is a sysudoku grading review of the Super Tough puzzles available on the KrazyDad website. KrazyDad is the creation of the very creative Jim Bumgardner. It offers for download a huge number of free Sudoku puzzles at levels ranging from Easy to Insane, along with a mind boggling array of other kinds of puzzles. That’s www.krazydad.com. The Super Toughs are almost Insane, being next to the highest level. Let me just say I’m glad I started there. If Jim likes what I’ve done here, and after I’ve posted a bit more Sudoku theory I have in mind, I just might go Insane. My grading survey sample of 10 puzzles were the #5 puzzles from volume 5, books 1-10. There are eight puzzles in a book, and 100 books in volume 5, so my review sample is a systematically scattered smattering. The conventions of the review table below are explained on the review page. The KrazyDad survey Super Toughs graded widely across the advanced methods, from bv scan to advanced coloring. The notable exception was the book 10 #5, which ran dry inbox marking at number 5, with only four numbers unassigned. Super Tough starting clues are generous, and line marking tends to be easier than the Sheldon and Longo puzzles just reviewed. A large bv field usually supports interesting bv scan activity. The review sample brought some remarkable coincidences of XYZ wings, XY-chains and finned fish occurring in pairs. There were also multiple techniques removing the same candidate and removing more than one candidate from the same cell. I’ll show these in my snapshots next post, but right now, let’s look into those alternative solutions of Super Tough v.5 b.1 #5. As a checkpoint on line marking, here is the grid with my fill strings attached. Five clues came from a naked single on the last line marked. Can you find the UR? I passed over it, thinking it was just too unlikely. But UR’s focus your attention on just such unlikelihoods. If 4r9c4 were true, it would force all the extas out and leave a deadly rectangle. The forcing chain is almost and XY needs a little imperfection at the end. After the upcoming Super Tough snapshots, we’ll conclude this KrazyDad review with a second puzzle, volume 5, book 8, number 5, the second from the review to reach the coloring level. It has coloring logic I had no examples for, in my coloring posts. If you would like to work through it with me, here is the starting grid. I’ll have the box marking trace next post. I’m looking forward to reviewing KrazyDad’s Insane collection. I think you will too, after you see my Super Tough snapshots. Don’t wait that long to download these collections. This entry was posted in Advanced Solving, Puzzle Reviews and tagged AIC almost nice loops, bi-value map, KrazyDad, unique rectangle. Bookmark the permalink.